From the age of 14 Mestre Marcelo studied under Mestre Suassuna. 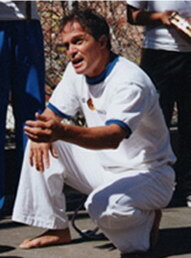 In 1984, Mestre Marcelo left Brazil and settled in the United States at which time there were only two other practitioners teaching Capoeira. Capoeira Mandinga, Mestre Marcelo’s organization, is a brother organization to Cordão de Ouro and is represented throughout the USA, in Israel, New Zealand, Mexico and now China. The Mestre is also known for his part in creating the character Eddy Gordo for the video game Tekken 3. He replied, “The dialog between players can start from a very simple repertoire of movements, kicks and escapes to a much larger and complex vocabulary that may include even floreios, body expression and perception of the game. Just a small vocabulary is enough to establish a connection that can clearly define the harmony of the two players, creating what we call a dialogue. Honesty, integrity and respect towards each other involves a bunch of things; for example: Knowing when you got caught by your opponent’s attack or trap and respecting that moment without taking advantage of it or ignoring it as a non threatening action. Also knowing how to control your kicks and strikes in a way that you don’t have to hit someone to prove your efficiency. When capoeiristas have the awareness mentioned above they will allow a certain flow in the game that can induce an incredible dialogue and perhaps even a trance like state.